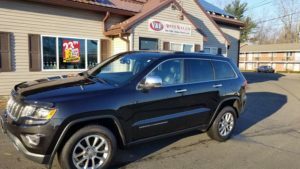 A 2015 Jeep Grand Cherokee Limited that recently hit our lot with only 20,125 miles. Examine the vehicle history report. A vehicle history report isn’t going to guarantee the condition of a car, but it’s always a good idea to check the vehicle history report and look for any red flags. This report is typically an important first step in understanding what kind of accidents the vehicle has been in over time– and how severe the damage was. While there are a lot of report providers out there, Carfax probably is the most well-known. Carfax has established itself as the benchmark for all other vehicle history reports so information from the incident, such as police records and insurance data, will likely show up on the report. And, unlike its competitors, Carfax reports also show maintenance dates and records if they’re available. When you’re buying a car that needs some work, this section of the report provides valuable insight into past repairs and recurring issues, and how well the previous owners took care of the vehicle. The data will only appear on a report if the car to a facility that shares its data, such as a franchised dealership service department, but this information is a huge bonus. Most dealerships have vehicle history report subscriptions, usually for either AutoCheck or Carfax, and many will run a free report for truly interested buyers. If a salesperson refuses to run a vehicle history report or provides an outdated report, that’s a huge red flag. If you’re shopping for a used car on the private market, or from an individual, the reports from the biggest players like Carfax can be pricey but many think the detail in the reports is well worth the extra dough. It’s easiest to look for obvious signs the car has been in an accident– mismatched paint, a panel that looks a lot newer than the rest, two different mirrors, a missing grill, dents, and other obvious signs of previous damage. If you can see extensive topical damage, chances are, the internal damage is much worse. If you can, you should also request a test drive. This way you’ll be able to see, hear, and feel for any internal problems and, perhaps more importantly, you’ll be able to gauge how comfortable you are driving it. Perhaps most importantly, have a trusted mechanic examine the vehicle. Ask them to assess the repairs that the seller outlined or recommended, and estimate the cost of services and replacements that will need to be made. Having the unbiased opinion of a third party will help you get a more holistic picture of the vehicle’s condition. You should also ask them to look for any underlying issues the seller they didn’t mention. If there are any immediate issues that would make the car dangerous or undrivable, that’s another red flag. If there are any upcoming repairs or maintenance services that need to be addressed in the near future, you may be able to leverage that information to get a better deal. Before you sign any paperwork or cut a check, be sure to ask a lot of questions. Most used car dealerships, like ours, will be upfront about any services that need to be done; some will even preemptively do them (or at least perform an analysis) knowing that a car sells better when it runs more efficiently– and when the customer knows exactly what they’re getting.